Movies in general are meant to entertain audience but there are very few movies that leave a major impact in the audience. Iraivi is one such rare gem that’s story telling & movie making at it’s very best. 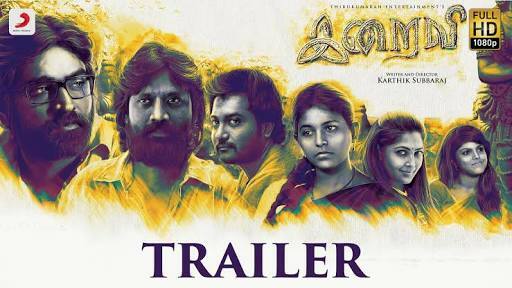 If Karthik Subburaj decides to treasure the choicest and best of his movies or show it to his grandchildren Iraivi will definitely be one among them. As usual he has come out with an out of the box concept yet again and a stellar cast augments the strength of the movie further. SJ Surya is the pick of the lot and he gives such an telling performance that’s both Authentic yet powerful. Vijay Sethupathi & Bobby Simha too do their part to perfection. Moving performances from Anjali & Kamalini. Kudos to Pooja for having accepted to play in such a role. Karthik is proving out to be an expert task master getting the best out of his crew. A Gem of a story is juxtaposed with the right elements in the form of an apt score, sincere screenplay & authentic performances. There are lots of twist & turns and throughout the movie you are at the edge of your seat trying to anticipate what will happen next. Sadly the director outthinks you each and every time. Few magical moments are equally accompanies by some ravishing score and Santosh seems to be growing in stature with each of his movies. If it was Mani – Raja or Mani – Rahman those days now it’s continuing with Karthik – Santosh. They have such an amazing chemistry between them that’s creating such a magic. The future of Tamil cinemas looks to be very safe & secure thanks to such amazing directors. This is an rare ,authentic gem of a movie that needs to be cherished and enjoyed. Go expecting the unexpected and you won’t be disappointed. Previous Previous post: The Inevitability of Emergent Strategy!